Snakebite envenomation in pregnancy is unusual, and the envenomation leading to acute kidney injury (AKI) makes the situation grave. It can result in maternal as well as fetal morbidity depending on the gestational age. Anti-venom is the mainstay of therapy, but its effects on the fetus are not well-known. Although the polyvalent antivenom is administered in the same dose as in nonpregnant individuals, renal replacement therapy (RRT) should be formulated in an intensive manner with good fetal monitoring. Daily dialysis sessions and fetal monitoring with Doppler, nonstress test, and biophysical profile form the core of successful outcome.,,,, There have been reports of bad obstetric outcome after bite and envenomation,,, while we present here, a case of the successful outcome of Russell’s viper bite envenomation and AKI at 20 weeks of gestation, with complete renal recovery and delivery of a healthy neonate. A 25-year-old pregnant woman (gravida 3 para 2) at 20 weeks gestation was brought to our hospital following snakebite. She was bit by Russell’s viper on the dorsum of her right foot. At admission, there was significant local reaction over the site, whole blood clotting time was >20 min, and international normalized ratio (INR) was more than 4. Seven vials of anti-snake venom were administered within 24 h of the event, but further doses were withheld due to allergic reaction in the form of pruritus. Twenty-four hours later, her urine output started decreasing, and she became oligoanuric. On examination, her pulse rate was 96 per minute, blood pressure was 110/80 mm Hg, temperature was 37.4°C, jugular veins were distended and abdomen was soft. On ultrasonography, the fetal heart rate was 125/min and regular and biometric measurements showed appropriate growth with normal volume of amniotic fluid. 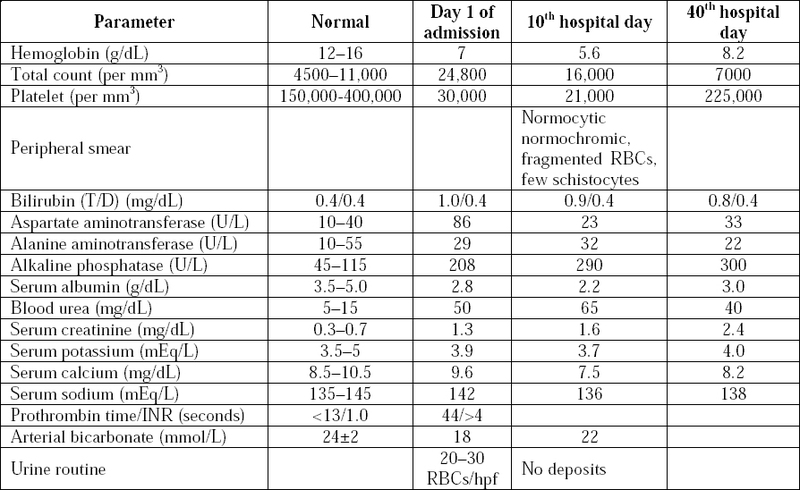 Complete blood count showed hemoglobin of 7 g/dL, total count of 24,800/mm3, and platelet of 30,000/ mm3, peripheral smear showed microangiopathic hemolytic anemia, and serum creatinine rose from 0.8 to 1.6 mg/dL within 24 h [Table 1]. Fibrin degradation products were positive in serum. In view of anuria, she was initiated on hemodialysis (HD), with carefully monitored 6 h sessions, blood flow of 150 mL/min, dialysate flow at 300 mL/min and frequent assessment of fetal heart rate. Two units of packed cells and 4 units of fresh frozen plasma were transfused. Over the next few days, she underwent daily dialysis, which was later reduced to alternate day dialysis, before discontinuation. Table 1: Laboratory data of the study patient. Overall, she received 10 sessions of HD and subsequently her renal failure improved to a urine output of 1500 mL/day and blood urea level of 40 mg/dL. She was kept in the hospital with daily monitoring of renal parameters and obstetric care. Fetal growth was monitored every two weeks and was found to have stage-one growth restriction at 30 weeks. Concurrently, betamethasone (12 mg Q24H, two doses) was administered for fetal lung maturity. At 30 weeks gestation, her serum creatinine was 2.3 mg/dL, and blood urea was 60 mg/dL; she had normal appetite, weight gain, and urine output. A week later, the serum creatinine dropped to 1 mg/dL, and blood urea was 30 mg/dL. At 32 weeks, she went into preterm labor and delivered a male baby weighing 1400 g having an Apgar score of 8 at 5 min and no congenital anomalies. The neonate was admitted to intensive care unit in view of prematurity for 10 days. The patient’s urine output, serum creatinine, and blood urea levels remained normal in the postpartum. Both child and mother were discharged from hospital 14-days postpartum. AKI occurring during pregnancy can have catastrophic consequences, both to the mother as well as the fetus. Pregnancy-related AKI (p-AKI) continues to be relatively common in many developing countries, including India (incidence 4.2%–15%), despite a reduction in its occurrence from conditions such as septic abortion and acute cortical necrosis. It is a serious clinical challenge for obvious reasons and necessitates a multifaceted approach for successful outcomes. While a major proportion of p-AKI is from obstetric complications, AKI from other possible causes can occur in a pregnant female. Common nonobstetric causes for p-AKI are listed in [Table 2]. Table 2: Obstetric and nonobstetric causes of acute kidney injury in pregnancy. Snake envenomation during pregnancy is very uncommon because of the confines of this special population. Pregnant women accounted for 0.4% of snakebite envenomation cases in a series from South Africa and 1% of cases in a similar series from India., The eventuality of snakebite envenomation in pregnancy are not well known but it appears to be associated with significant fetal wastage and maternal morbidity. Ensuing maternal shock, pyrexia, venom-induced cytokine release and uterine contractions and placental bleeding can induce fetal abortion. In a prospective study at two hospitals in Sri Lanka, 39 pregnant women admitted with envenoming following a snakebite were reported. There were 11 abortions (28.2%) and one birth malformation (hydrocephalus and polydactyly). All abortions occurred within seven days of the snakebite and in <18 weeks of amenorrhea. The authors concluded that, women in the first trimester were at higher risk of having a poor fetal outcome compared to women in the third trimester. The venom in maternal circulation crosses the placenta and can affect the fetus even without envenomation of the mother. Slowing of fetal movements and loss of fetal heart rate variability are ominous signs indicating depression of the central nervous system. Specific antivenom has been shown to curb venom-induced uterine contractions and to foster recovery of fetal distress within 24 h of therapy. Treatment with anti-snake venom has resulted in a good maternal outcome, while the effects of anti-snake venom on the fetus are difficult to assess. Mono-specific antivenom is the treatment of choice of snakebites but it does not guarantee prevention of AKI. Viper bites can lead to renal failure, intra-vascular hemolysis, intravascular coagulation, and hemolytic uremic syndrome. The course of AKI usually ranges from two to three weeks. Our patient developed severe systemic complications from snakebite envenomation, including AKI requiring prolonged dialysis. The objective in this scenario should be to ensure maternal survival and increase the chance of a successful pregnancy, with minimal ill effects on the fetus. She was managed with intensive RRT with precautions to avoid hemodynamic and metabolic complications during dialysis treatment. Unlike p-AKI from obstetric complications such as preeclampsia or hemolysis, elevated liver enzymes, low platelets syndrome, AKI from other causes is not per se, an indication to terminate pregnancy and the successful outcome in our case asserts this tenet. However, there are some special considerations which need to be kept in mind while performing RRT in a pregnant patient with AKI [Table 3].,, Aggressive fetal monitoring with Doppler until 25 weeks and subsequently by contraction stress test, nonstress test, biophysical profile or umbilical artery Doppler should be carried out. Table 3: Special considerations for renal replacement therapy for acute kidney injury in pregnancy. This patient had Russell’s viper bite-induced AKI, hemolytic uremic syndrome, coagulopathy, with no pronounced ill-effects on the fetus. The management of this situation needs integrative care from the treating physician, nephrologist, and the obstetrician. Anti-snake venom, intensive RRT and obstetric monitoring were the principal factors for the successful outcome in this pregnant female. Seneviratne SL, de Silva CE, Fonseka MM, Pathmeswaran A, Gunatilake SB, de Silva HJ. Envenoming due to snake bite during pregnancy. Trans R Soc Trop Med Hyg 2002;96:272-4. Krane NK, Hamrahian M. Pregnancy: Kidney diseases and hypertension. Am J Kidney Dis 2007;49:336-45. Lindheimer M, Conrad K, Umans J. The normal and disease kidney in pregnancy. In: Schrier R, editor. Diseases of the Kidney and Urinary Tract.8th ed., Vol. 3. Philadelphia, PA: Lippincott Williams & Wilkinson; 2007. p. 1933. Gammill HS, Jeyabalan A. Acute renal failure in pregnancy. Crit Care Med 2005;33 10 Suppl:S372-84. American College of Obstetricians and Gynecologists. ACOG practice bulletin. Clinical management guidelines for obstetrician-gynecologists, number 70, December 2005 (replaces practice bulletin number 62, May 2005). Intrapartum fetal heart rate monitoring. Obstet Gynecol 2005;106:1453-60. McNally SL, Reitz CJ. Victims of snakebite: A five year study at Shongwe hospital, Kangwane, 1978-1982. S Afr Med J 1987;12:855-60. Bhat RN. Viperine snake bite poisoning in Jammu. J Indian Med Assoc 1974;63:383-92. Dunnihoo DR, Rush BM, Wise RB, Brooks GG, Otterson WN. Snake bite poisoning in pregnancy. A review of the literature. J Reprod Med 1992;37:653-8. Chugh KS. Etiopathogenesis of acute renal failure in the tropics. Ann Natl Acad Med Sci (India) 1987;23:88-99. Osman OH, Gumaa KA. Pharmacological studies of snake (Bitis arietans) venom. Toxicon 1974; 12:569-75. James RF. Snake bite in pregnancy. Lancet 1985;2:731.